Among Chinese, the Ghost Festival and Tomb Sweeping Days are times to honor ancestors and appease ghosts and spirits of the dead. It’s all part of the traditions and superstitions in Chinese life and culture. This day at the beginning of April, is for honoring ancestors and to make sure they are happy in the after world. Ancestor worship includes cleaning and sweeping of their graves, offerings of food, normally fruits, buns and sweets, and burning incense. It is also common to burn other offerings, specially "ghost money". The belief is that by burning something, the essence of the burnt element is transferred to the spirit world, where it can be used by the dead. It used to be that the most common item being "sent" was money, so the burning of paper money was most popular. Nowadays, there is quite a variety of items being "sent", from iPads and cellphones to cars and even modern appliances that could be "useful" to the receiver in the other world. So side by side with the traditional paper money, you see paper replicas of all the different gadgets which are burn and transferred to the deceased. Nowadays, people like to fly kites during the Qing Ming Festival, and as it is the beginning of Spring, it is also a time to plant trees. The Seventh Lunar Month is the Ghost Month. 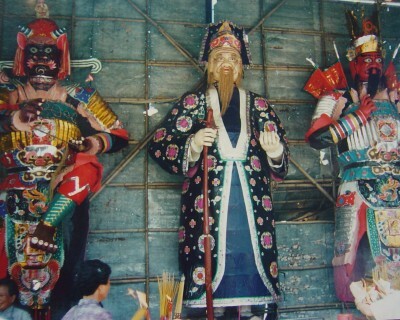 This is the opposite of the Qing Ming Festival where the living pay homage to the dead. In the Ghost Month, the gates of the afterworld are opened, and the spirits come to pay a visit to the world of the living. Spirits are powerful and people treat them with respect. To keep them happy, they make offerings of food and burn incense. Sometimes you see offerings by the side of the road. This is for the orphan spirits who have no one to take care for them. You wouldn't want a stray angry spirit roaming around your home... Unhappy spirits can make bad things happen! Rituals and ceremonies are performed to appease the spirits. Watch this Chinese Ghost Festival video. 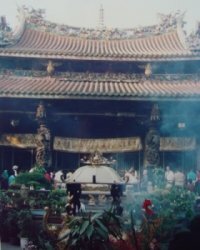 The Sheman, or Taoist Master performs a ritual to consolate the spirits in a Taiwan temple. Tomb Sweeping Day will be on April 5, 2019.